Between Joy-Anna and Johannah, Jim Bob and Michelle Duggar have six boys: Jedidiah, Jeremiah, Jason, James, Justin, and Jackson. Can you tell them apart? We have added their pictures in a random order below. Give it a shot, and post your guesses as a comment. These are the names, I believe. Great site! Love love love the great updates! 1-Jason, 2-Jackson, 3-James, 4-Jeremiah, 5-Justin, 6-Jedidiah. 6 4 1 3 5 2 is the order of the boys ages. 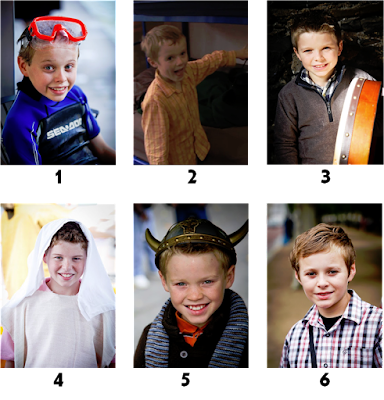 Jason, Jackson, James, Jeremiah, Justin and Jedidiah. p.s.lot of the duggar fans do know all the little duggar boys maybe if you want to lily and ellie you can do the duggar little girls and the older girls and the older boys if you want to it is up to you. SOOOO easy!!! I can tell each one apart so easy!! I want to marry Josiah!